A slow growing evergreen groundcover with dark purple, almost black, grass-like foliage. The light pink, mid-summer flowers, are held on racemes that rise slightly above the foliage. Spreads slowly by rhizomes. 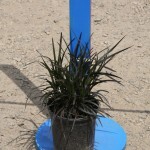 Plant in full sun to part shade, in a rich, medium moisture soil. Don't allow it to dry out.